When that occurs, I simply temporarily allow the entire page, pick the pizza or pie pictures and go on my way. The blocked scripts list has not changed in ages, so why are warnings now being triggered that were not triggered before? I set a timeout of 4 seconds to have the notification close automatically, but that doesn't explain why it is now triggered to begin with. 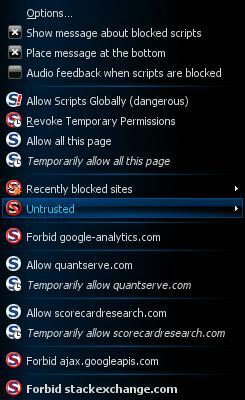 The same blocked sites quantserve.com and scorecardreasearch.com have been blocked since I joined SO and they have never triggered warning with each page load before. Has something changed on SO that would explain the new noscript warnings today? (there have been no browser updates to explain the change on my end) Or, is this a new present from one of the allowed scripts google-analytics.com, ajax.googleapsis.com, or stackexchange.com? Any insight would be appreciated. I know I haven't seen an adzerk.net script from SO before today. (I could also be going senile...). Is that new? It appeared in the noscript list not too long after the original post. e.g. Change - pressing back in browser no longer return to correct place in SO question list?